The classic binary option is binary because it only has two possible outcomes: when the option expires, you either lose all your money or you get paid a pre-specified amount. Today, when binary options have become so popular online, some sites that sell binary options offer novel variants that actually have more than two possible outcomes, but these variants are quite rare and doesn’t make up the bulk of available binary options online. One of the reasons why binary options are so popular is because you know in advance exactly how large your profit will be if your binary option expires in the money. With a normal non-binary option, it is possible to finish in the money and still lose money, because the cost of buying the option was higher than what you are being paid upon expiry, e.g. if the underlying asset has just barely made it up to the required price level. With binary options, you know even before you buy the binary option exactly what it will pay you if you buy it and it later expires in the money. If you want to trade binary options you need an account with a binary options broker such as HighLow , Markets.com, Binary.com and ETX Capital. All-or-nothing option is an alternative name for binary option. It high-lights how you either get fully paid or lose the entire stake. Digital option is an alternative name for binary option. This term is especially common when the underlying is a currency pair or an interest rate. 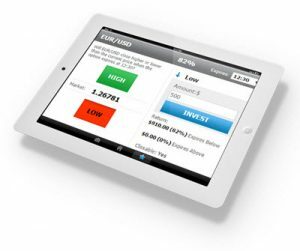 The American Stock Exchange use the term Fixed Return Option (FRO) for the binary options traded on that exchange. The cash-or-nothing is a binary option where you get paid in cash when the option expires in the money. This is by far the most common binary option. With an asset-or-nothing, you get the value of the underlying asset if the option expires in the money. So, if the underlying asset is a share in JKX Oil & Gas plc (LSE: JKX), you get the price of one share that company if your binary option expires in the money. The classic type of binary option is the Higher/Lower type. Example: You buy a binary option where the underlying asset is NYSE: ABB (shares in ABB Ltd listed on the New York Stock Exchange). When you buy the option, NYSE: ABB is trading at 24.03 USD. The option is set to expire four hours from now, and will finish in the money if NYSE:ABB is trading above 25.00 when the option expires. So, this is an option that you would buy if you believe that the price of ABB shares are about to climb very soon. What to do if you believe that the price of ABB shares are about to drop? Well, you can buy a Lower binary option, e.g. a binary option that will pay you money if the price of NYSE: ABB is lower than 23.50 when the option expires in four hours from now. The possible payout is stated clearly when you look at available binary options. You set the parameters for the binary option on the trading platform and see how much you would get paid if you bought this binary option and it expired in the money. Some binary option sellers have tweaked the basic premise of binary options by giving you a small consolation price if your binary option expires out of the money but very close to the money. Here are a few examples of binary options that do not stick to the classic High/Low configuration. Please note that each vendor of binary options can make up their own names and rules for their options, so it is important to always check the find print. When the option expires, will the price of the underlying be higher or lower than when you bought the binary option? If you think it will be higher, buy an UP binary option. If you think it will be lower, buy a DOWN binary option. Will the price of the underlying ever touch a certain predetermined point throughout the lifespan of the binary option? If you think it will, buy a TOUCH binary option. If you think it wont, buy a NO TOUCH binary option. When the binary option expires, will the underlying asset price be within a certain predetermined range? If you think it will, buy an ENDS IN binary option. If you think it wont, buy a ENDS OUT binary option. Will the underlying asset price stay within a certain predetermined range throughout the lifetime of the binary option? If you think it will, buy a STAYS IN binary option. If you think it wont, buy a GOES OUT binary option. CySEC has been regulating binary options since 2012. It is illegal for companies based in Cyprus to sell binary options without adhering to CySEC rules. This also means that they must follow the European Union MiFID regulation regarding consumer protection, since Cyprus is a member and binary options are classified as financial instruments in Cyprus. To protect binary options buyers, CySEC publishes the names of Cypriotic companies that fail to live up to the CySEC standards. This includes, among other things, companies that have had their CySEC license suspended. CySEC can also impose penalties on binary option sellers that break Cypriotic law.